How does one start thinking about the long overdue restoration and redesign of 24 Sussex Drive, the storied home occupied by lumber barons and prime ministers and their families? A local design publication asked a few designers how they would approach it, given the opportunity. For 2H, you start and end with place. 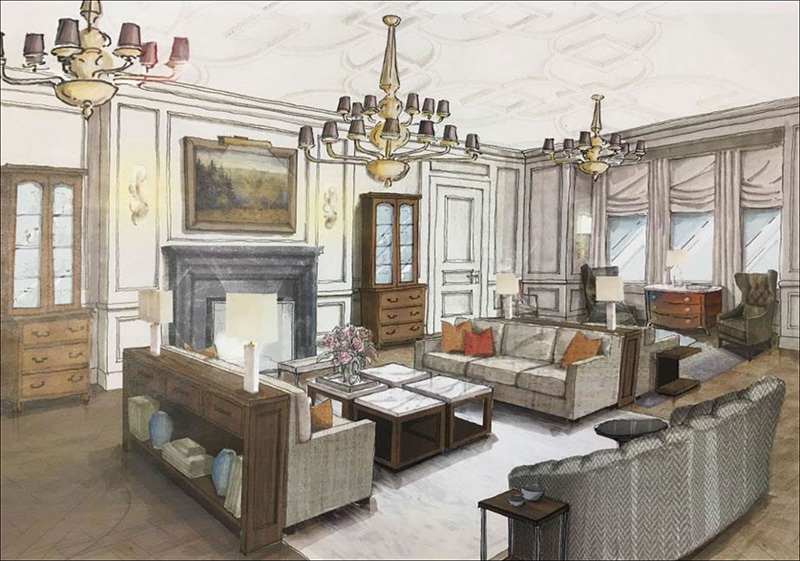 Steeped in history, 24 Sussex is a building worth restoring. 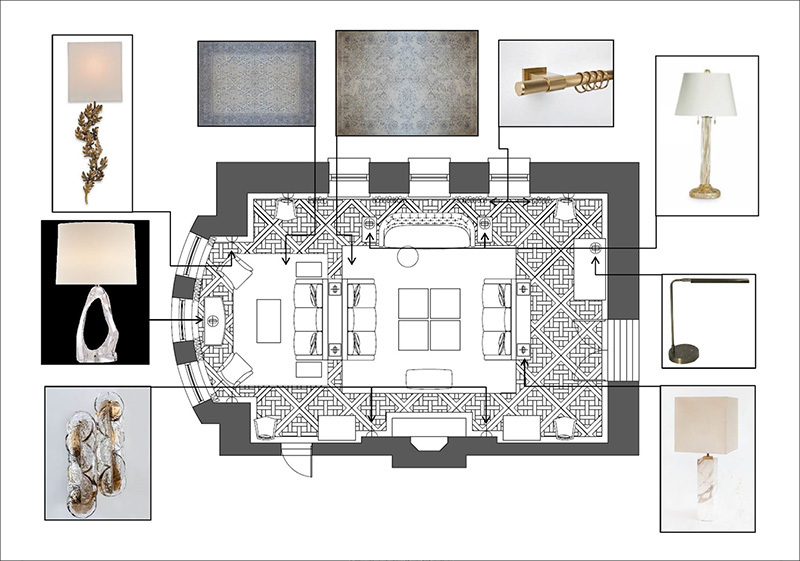 2H has selected the formal drawing room and their restoration approach will reflect some of its roots. Its proximity to Earnscliffe, the home of Sir John A. MacDonald, and Government House, makes restoration and redesign an attractive option as the neighbourhood is already an important historic enclave. The best design must aim for so much more than simply recreating the past; it must simultaneously be forward-looking, and anchor itself in what Canada represents today: innovation, openness, curiosity and the strength of our cultural diversity. It is in the natural tension of old and new that 24 Sussex can find a new and, most importantly, meaningful life. The 2H approach would reflect both the architecture and history of this important landmark, and its location overlooking the Ottawa River – a major transit way for the burgeoning lumber trade of the day. We believe this room should be completed using mostly Canadian made custom products and artistry throughout. 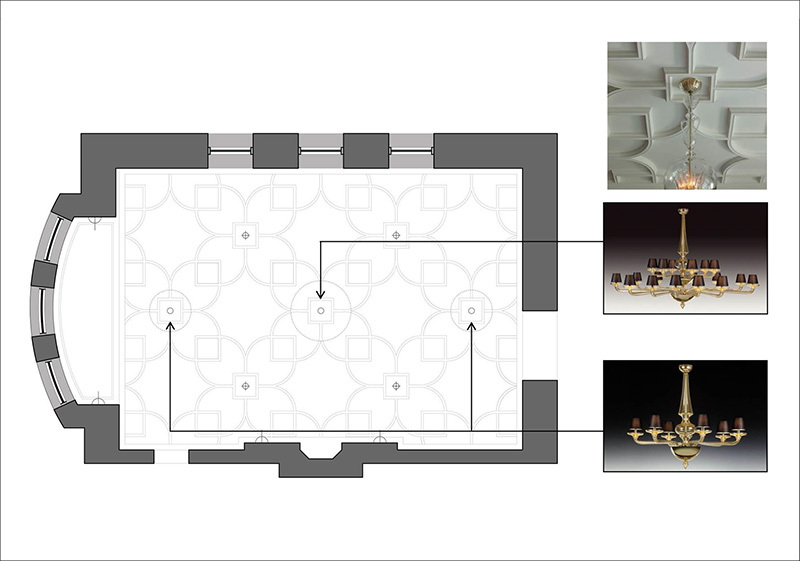 Exceptional Canadian craftsmanship and talent can be a centrepiece of this important multifunctional room. 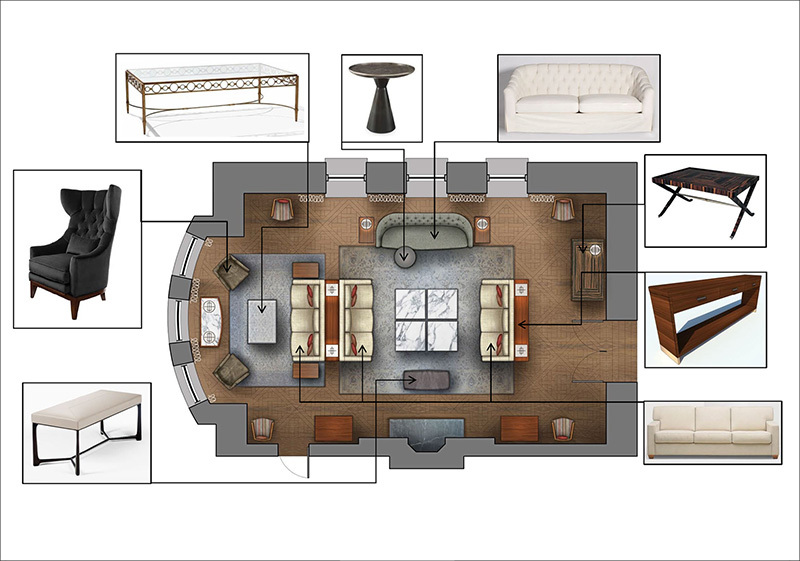 The space will feature some existing period furniture, complemented by the repetition of clean-lined tuxedo-style sofas. The fireplace surround will feature carved Canadian soapstone and the room will be adorned with modern and classic Canadian art – all while respecting the critically important Aboriginal roots of this country. We would anchor the room using flooring milled locally using reclaimed logs from the Ottawa River. It is not only an historically interesting product, but it is a superior wood with greater density and better patina than any contemporary wood available. Laying the floor in a unique parquetry pattern also emphasises a theme of the early Canadian lumber trade as this type of floor pattern is found in many of the “grander” historic buildings in Canada. The drapery will be edited and relaxed, dominated by tailored shapes and tone-on-tone hues, which will impart a gentle and textured feeling. Lighting will be comfortable and relaxed, created by layers of soft lighting, from ceiling fixtures, downlighting, to accent table lamps and wall sconces. Fine craftsmanship will hold the highest priority in this restoration, from floors to mouldings to furniture pieces, and antique and modern furnishings distinctive for their precision workmanship and artistry. 24 Sussex Drive needs to be multifunctional. Suitable for contemporary family life for its future occupants while at the same time elegant enough to hold its own at the highest level for smaller formal gatherings. 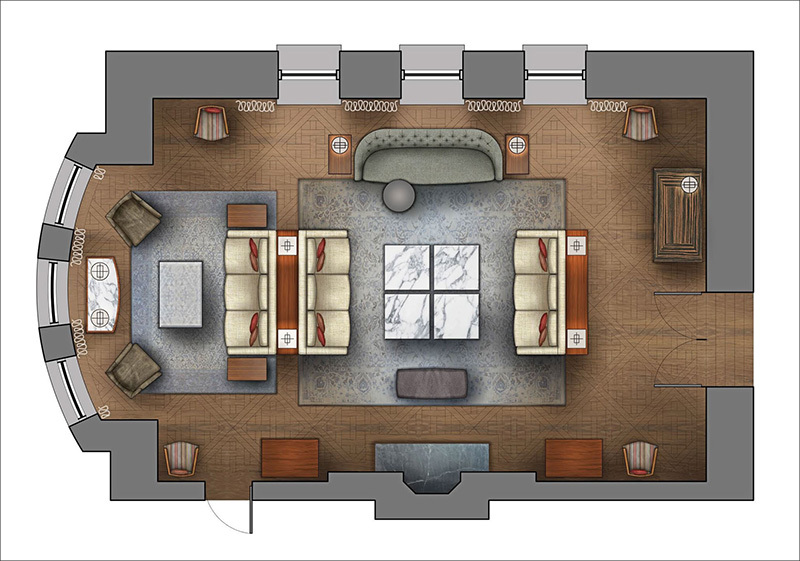 One wants this room to reflect the best design that Canada has to offer, while retaining elegance and comfort.